Stick to the Regular Plan As Much As Possible: In an attempt to convince myself that I'm not a workaholic, I often leave my work computer at work. However, I back up all of my files to Google Drive and I was glad to have them accessible in this situation. I looked at the unit plan and wrote substitute teacher-friendly lesson plans as much as I could. This will ensure that my class is not too far behind when we return from Thanksgiving break. Keep an Extra Set of Textbooks At Home: While I may not have my work computer at home, I do have an extra set of textbooks sitting in my den. They definitely come in handy when it comes to writing last-minute sub plans. Only Leave Out One Plan: I learned this one the hard way. I was out for a multi-day conference a few years ago and left three days worth of sub plans on my desk. Upon my return, I found out that I had three different substitute teachers in my room and that the first teacher gave the students all three assignments. Luckily, the other two subs asked early on about the missing sub plans and my colleagues were able to find something for the students to do. Now when I know that I am going to be out for more than one day, I give a trusted colleague a folder for each sub plan and ask her to hand one to either the office or the sub one at a time. 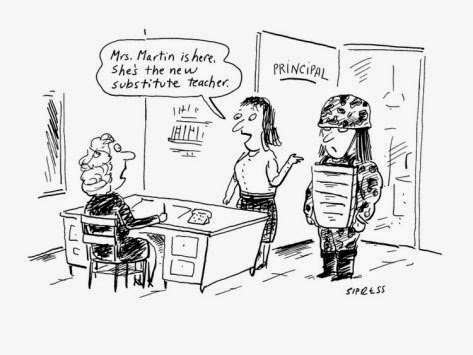 Make Sure The Students Know the Expectations: In the situation above, the substitute teachers knew to ask about a plan. However, I once had a situation when for whatever reason the wires got crossed and the substitute never received a lesson plan, nor did he ask. In an attempt to be proactive, the class reported that the substitute actually picked up Hooters menus during his lunch break and handed those out for the class to read (no, I'm not making this up and I did indeed find menus on my desk upon my return). Luckily the kids got together and brainstormed my reaction to them spending their class period doing this, took out their textbooks, found an interesting story to read, answered the comprehension questions and then made sure to leave it on my desk for me to correct.